I was going through my collection, trying to decide on what polish to put on my nails. I’m still trying to make my way through all of the polishes that I have yet to wear, but this one caught my eye. I purchased this polish in the Deborah Lippmann Get the Party Started set last summer and immediately dug into it. It was a 3 polish set that came with the original Happy Birthday, Candy Shop which is the same style as this polish but in a pink base, and then this polish. I’ve worn this polish before but I never posted it. I actually saved it for 5 months after buying it because I wanted the first time I wore it to be on New Years Eve. Typing it out and admitting it to the world via the internet is kind of embarrassing but I’m going to be honest. It reminded me of New Years in a bottle with the dark black base and every color glitter in it. I normally would have posted a New Years manicure, except I spent Christmas and New Years in the UK and purposely didn’t take my computer. So I figured this polish should have been included in my un-used polishes because I never got to photograph it and show you guys. 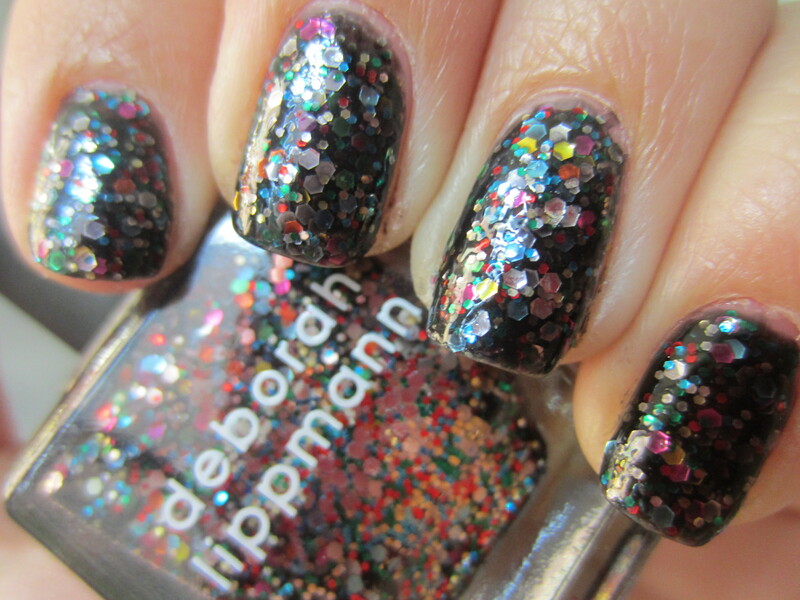 Anyways, here is another one of the Deborah Lippmann party in a bottle glitters! 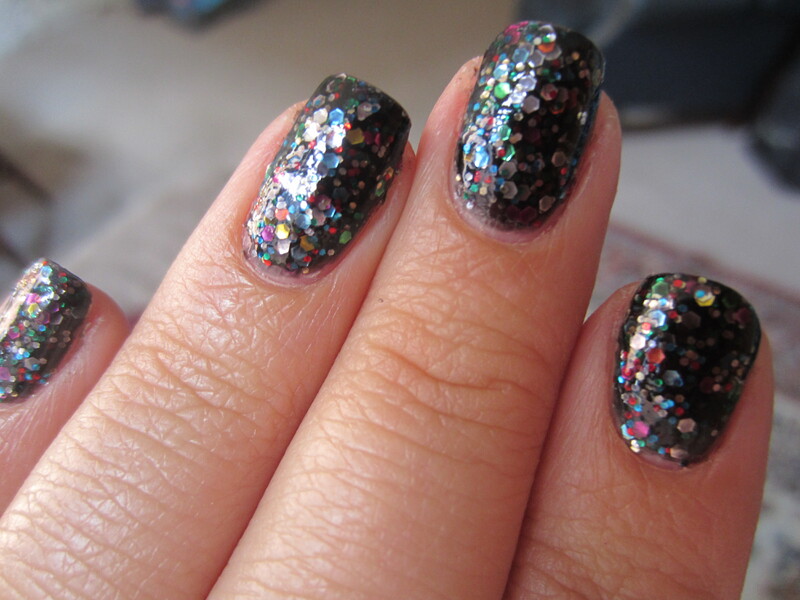 Deborah Lippmann “Forget You” is a black jelly base that is crammed with the Happy Birthday style confetti glitters. There is every color of the rainbow chunky glitter in this polish. The formula on this polish was a little thicker than I usually expect with a Deborah Lippmann. All of her chunky glitters suspended in a colored jelly base are a little thick but that’s all due to the glitter. For some reason this polish was uncommonly thick! This is 2 coats and the black is completely opaque. But it was like applying chunky tar onto my nails. It was a little hard to move the glitter around so the polish around my cuticles looked even. Plus with such a thick formula, I had to apply 2 coats of top coat. Even after a ton of top coat it didn’t seem as shiny as other Deborah Lippmanns, nor was it that smooth. Overall, I like the color concept but wish the application was smoother. And as you would have guessed, taking this off took for-freaking-ever and I was ready to just give up and paint my next manicure over it. I got a ton of compliments while wearing this and it was a really fun polish to wear out at night. This might have to be a special occasion, fun night out type of manicure because I’m too lazy and don’t have the patience to play with this polish a lot. ← Urban Decay Urban Defense Tinted Moisturizer Review! So pretty! Does it have purple glitter in it? I don’t think Happy Birthday or the many dupes have purple glitter in them, which I was really disappointed by.